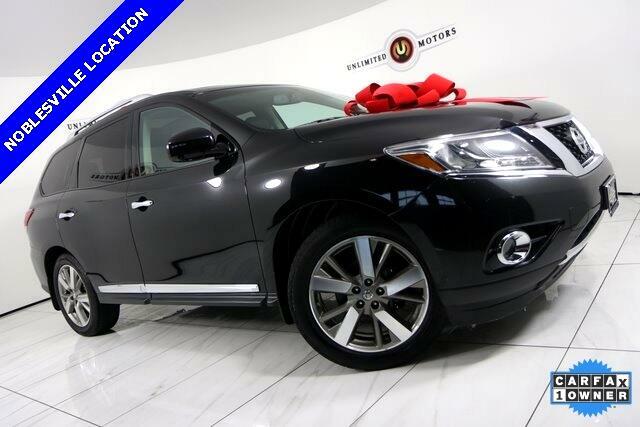 Navigation, Back Up Camera, Bluetooth, Sun/Moon Roof, Heated Seats, Towing, 3rd Row, Pathfinder Platinum, 4D Sport Utility, 3.5L V6, 4WD, 13 Speakers, 3rd row seats: bench, 5.25 Axle Ratio, Alloy wheels, Blind Spot Sensor, Dual front impact airbags, Dual front side impact airbags, DVD-Audio, Four wheel independent suspension, Garage door transmitter: HomeLink, Heated & Cooled Bucket Seats, Heated door mirrors, Heated front seats, Heated rear seats, Heated steering wheel, Leather Seating Surfaces, Memory seat, Navigation System, Power Liftgate, Power moonroof, Radio: Bose Audio System w/AM/FM/CD & 13 Speakers, Rear Parking Sensors, Reclining 3rd row seat, Split folding rear seat, Spoiler, Steering wheel memory, Ventilated front seats. CARFAX One-Owner. Clean CARFAX. 19/26 City/Highway MPG Priced below KBB Fair Purchase Price!